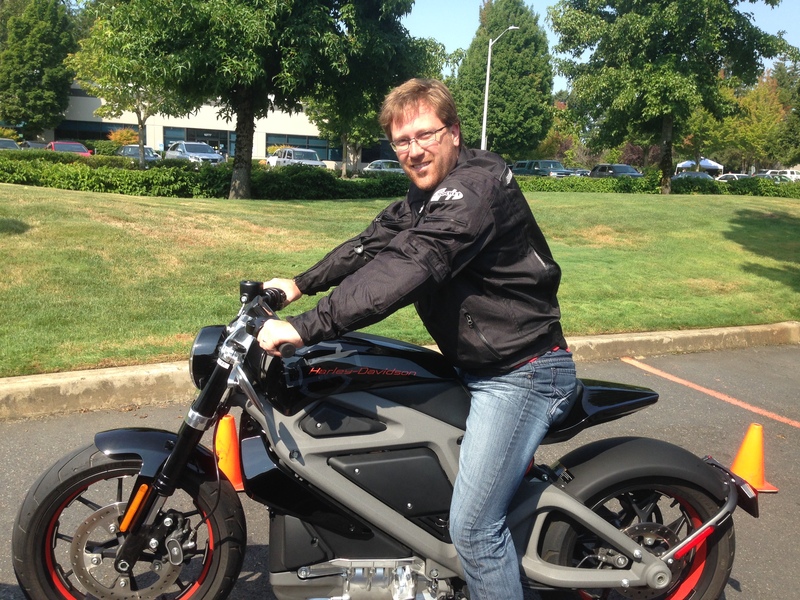 When Harley announced that they would be taking their new electric concept motorcycle (tagged as Livewire) on tour for people to try out, I jumped at the opportunity. There was the usual sign-up and then forget about it for a while process, then finally a confirmation and dates set. 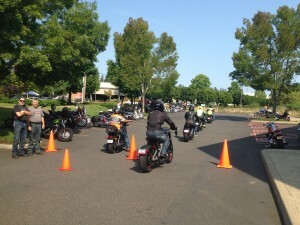 The local Harley dealer in Tigard being the venue and I picked a nice mid-summer morning on a Saturday. 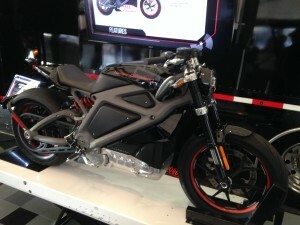 impressed to see that not only were there plenty of electric bikes waiting in the wings, but there was a full tent set up with LCD clear overlay displays in front of the naked bike frame, an actual bike on a dyno that people could “ride”, and lots of informative propaganda. The Kickstarted heads up display maker Nuviz was on site as well, joining in the future technology fair and it was great to see their functional prototype in person. I confirmed my registration, signed my life away for liability, and watched their instructional safety video (don’t rev the throttle on an electric bike for you might lurch forward…deal). They brought the five of us out to the demo bikes, partially charged and waiting for our eager hands. They provided a little more safety instruction and then walked us through powering the bike up. It was a fairly simple process: turn on with right power switch, wait for 111 to display on the rather large touchscreen LCD attached to the handlebars, then press the start button until it read zero. I noticed once this was “started” that a distinctive hum was coming from the tank area (can you call it a tank without gas?). I would bet this is from an on-board inverter as they convert the DC power of the lithium ion batteries to the AC power required by the motor. There was the option to select power or economy mode which can only be changed again once the bike is switched off and on again, I chose power. We packed up in a stagger formation behind the lead bike (a gas powered Harley), and headed out. Throttle response was crisp but forgiving from a standstill. There was a lot more play before the bike started pulling hard than I would have expected. This allowed for a smooth takeoff without jerks and I appreciated that. We pulled into traffic and side streets of town, and as speed picked up, so did the distinctive whine of the motor system. It reminded me of the gear whine of my electric R/C cars back in the day, but times 100. The sound did help contribute to the sense of speed, along with the wind against my body. At certain speeds however it was rather loud (I did this ride without my normal earplugs on purpose) and it could be dialed back a bit. Rumor has it that the engineers accentuated this sound to make it more distinct. The power however, seemed more than enough for this fairly smaller feeling bike. I never felt as though it would actually need more. Braking was a whole new ballgame however. They mentioned regenerative braking (where the electric motor recaptures some of your inertia to recharge the batteries), but I had no idea it would be so pronounced. The feeling was similar to say letting fully off on a large bore gas powered bike and having the engine’s compression slow you down. Suffice it to say, I rarely felt the need to ever touch the brakes at all, as the regen process was more than sufficient to bring the bike to a complete standstill. Given that vehicles behind you would never see brake lights with this approach it is up to the rider to be diligent about flashing the brake lights even if you don’t need them. 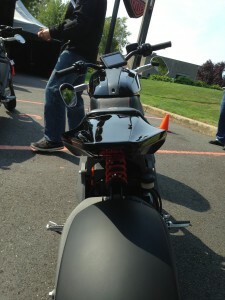 Alternately, it would be nice to see motion sensing built into the bike that flashes them for you when you let off the throttle hard (similar to the aftermarket kits available that do the same thing). Handling was easy and smooth. The bike moved with ease into curves without excessive pressure on the bars, tracked well in a straight line, and s-swerved around utility covers without any drama. Given the short ride we took it was hard to say how it would handle in a long mountain road, but then again, that likely isn’t the target for a bike with a limited range. Overall, felt like it could handle anything without fuss or muss, similar to say…a Suzuki SV650 (or a Buell I guess too). In comfort and ride-ability the bike seemed fine for the most part. The controls and touchscreen all worked fine. The riding position was a hybrid of sport-standard, which seems like a new tactic for Harley, unless you count what they acquired with Buell. With the rider slightly forward, you feel engaged in what is going on, though I did have to look down a little to see the display and my current speed (which was bright and visible even in full August mid-day sun). They don’t seem to be considering a passenger as there is only a solo saddle, but with limited power and range I’m sure that’s for the best anyway. The major niggle with the bike in this area were the mirrors. They were tucked in under the handlebars in such a way that I would have to lift my arms, hands and even duck down a little to see out of them. In my opinion some low profile bar top units or even bar end items would help immensely. On the ride we managed to get up to 40mph in one stretch, though most was in the 25-30 range though neighborhoods. 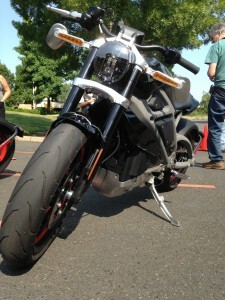 The bike was stable at all of these speeds and power wasn’t lacking anywhere in the range. For 15 minutes or so of riding, used up about 6% of the battery charge (was riding in power mode). All told, I’m very impressed by this bike which we are told is a hand built prototype and not a production model. Fit and finish was certainly already up to par. With a couple improvements around safety really (mirrors, brake light flashing on decel) the bike could be pretty good to go to market. 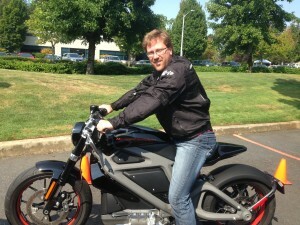 I look forward to seeing how Harley takes this innovation and pushes themselves into the future. 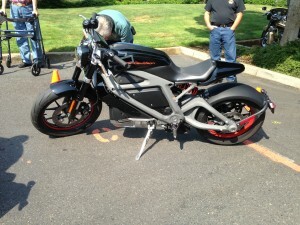 This entry was posted in Motorcyling and tagged demo ride, electric motorcycling, Harley, Livewire, nuviz, projectlivewire. Bookmark the permalink.